I was just talking about the border map. The past Hammerfell/Skyrim border should follow the edge of the forest, not cut through it. Not proposing any region border changes, just commenting on the map I did. worsas wrote: 1. We should rename the Aldkarth Lowlands instead of Midkarth. For the Midkarth we weren't able to come up with a better name, after all. But maybe we can think up a better name for the lowlands. I agree, in general. When I proposed to make that cell part of the Foothills, I meant only a region it'd belong to engine-wise, without conducting any overhaul here. Border cells have their own rules, where it's hard to tell the regions apart, so I thought any additional work would be unnecessary here. At any rate, I'm of course fine with making this area belong to Midkarth region too. As a side point: I can't help but feel that Sundered Hills (and following areas, as far as to White Hold/Falkreath) should actually be the most foggy regions. I don't know, I understand there's hardly any water there so it wouldn't make much sense, but a rule of cool just keeps giving me that vibe. That gray-brown color palette just works extremely well in foggy weather in my opinion, and that's all. 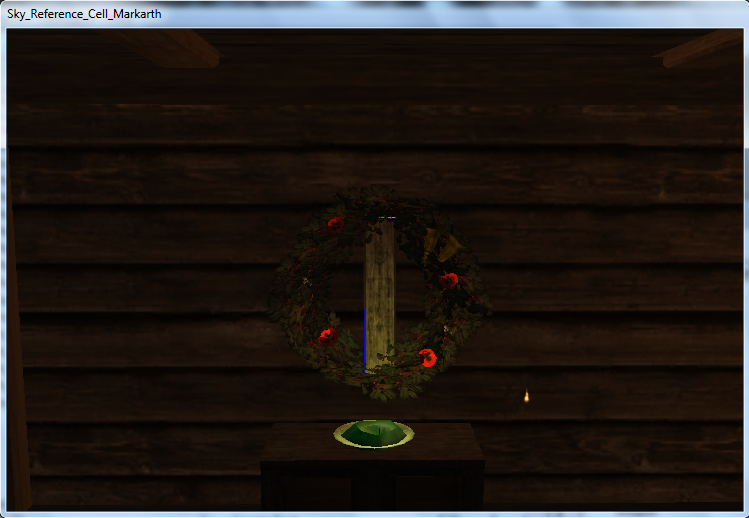 An idea to deepen the wreath idea: how about employing spineinside's recent 'mystic boards' here? Here's the image I thought about: these boards actually have some small odes and prayers (let's say the way Nords perceive religion it'd be really hard to tell one apart from the other) to saints/heroes and gods/higher spirits; in this case - to Mara. The shrine is generally created by nailing the board to the wall, hanging the holly wreath Worsas did on it so the board is a line in the circle the wreath creates, and then putting flowers, jewellery etcs in the wreath. In the surroundings of the shrine some candles and offerings can be seen, too. These boards used that way would be distant relatives of Imperial Runestones. We can expand/justify the concept of Nords not having sacred paintings/stained glass windows or even statues showing their gods, how Imperials do, by saying that people of Skyrim are a tad iconoclastic (in a meaning of professing iconoclasm), too? That additional stuff around the wreath looks like something you could make in some special cases, but I wouldn't use it as a general way to portrait nordic religiousness, as it's little less than a houseshrine, imo. I think that we shouldn't portrait Nords as particularly religious people anyway. But as said, I'm not speaking against exceptions and I don't want to act like a big surpressor on your ideas, I just want to voice my concerns about them. Regarding the Sundered Hills. I just always saw them as a dry and sunny region, like the Aldkarth Lowlands. Geographically they are bordered by regions with more altitude (east > ridgelands, west > Druadach Highlands) that would be likely to catch much of the downfall of rain. But that's probably just me making up something to justify my preference . It's also something that would, imo, work better together with Karthwasten. I just don't see it as a foggy or rain-plagued town. Doesn't feel right to me. The Mara veneration and hints of Nordic religiousness should really only be a minor way to portray these farmers as Nords, not the primary one. I'm thinking in more general stuff like palisades, Nordic crops and farm animals, animal skulls and old weapons hanging on walls etc. etc. If you catch my drift. I too see the Sundered Hills as a dry region, but I wouldn't mind the occasional fog here.